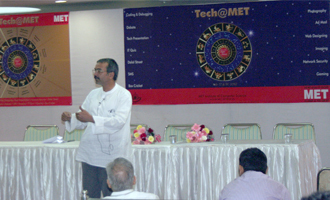 MET Institute of Computer Science organised the Mega Intercollegiate IT Fest ‘Tech@MET’ for the IT students of various colleges on February 17 – 18, 2010. This is a popular annual IT fest which all the IT students look forward to. Over 450 students from across 18 colleges attended this mega two days event. Amongst the colleges that participated were Hiray, SNDT, KJ Somaiya, Vivekanand, Vidya Vihar, Bharati Vidyapeeth, YMP, Thakur, National etc.